What is Weibo? When talking about social media platforms, most people from the west may be more familiar with Facebook, Twitter and Instagram. 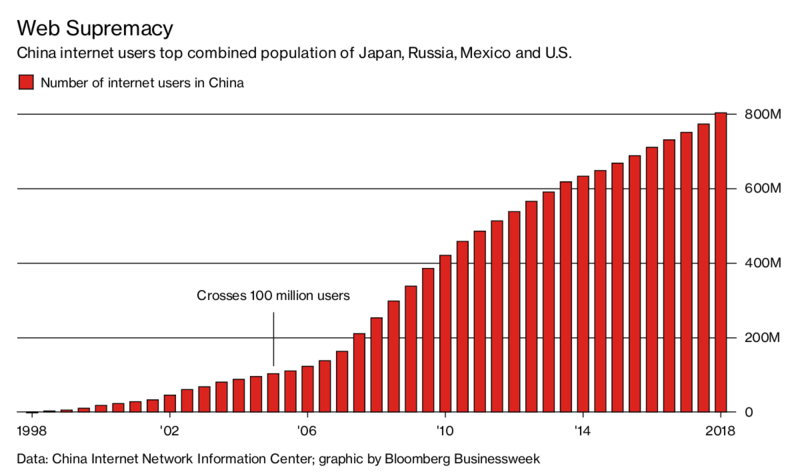 While in China, WeChat and Sina Weibo are taking the lead. 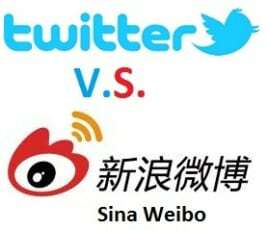 Sina Weibo (新浪微博), commonly referred to as “China’s Twitter”, is a micro-blogging site and one of the largest social media platforms in China. Weibo can be better compared to the Facebook of China, as it’s more open and newsfeed based than WeChat. 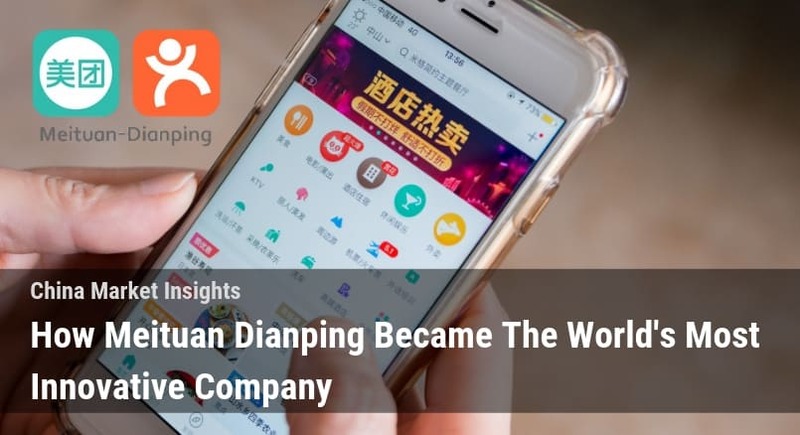 Launched by the Sina Corporation in 2009, it has reached a total of 462 million monthly active users, with USD $481.9 million net revenues in 2018. Over the past 10 years, Weibo has transformed from a simple blogging site to a comprehensive social media platform, which has become an indispensable part of Chinese people’s everyday life. Sina Weibo, often simplified as “Weibo” (the Chinese word for “microblog”), is a leading micro-blogging platform in China. 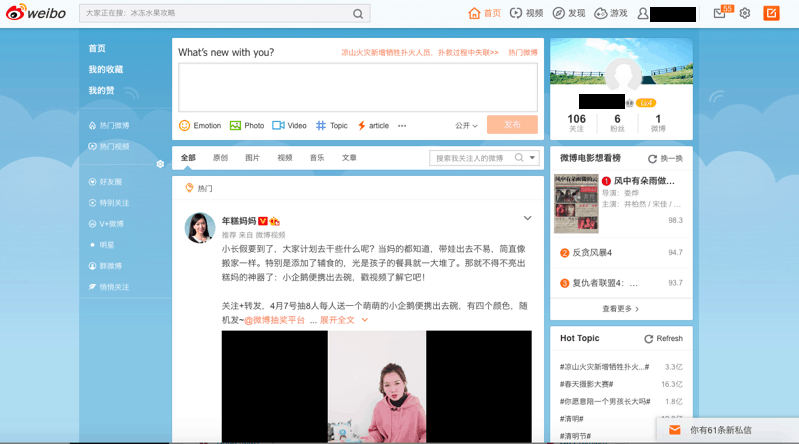 Not only does it serve as an efficient channel for netizens to create, distribute and discover content, but also as an effective information centre for the latest topics and social issues, as lots of journalists distribute news through their Weibo accounts. Besides, it is heavily used for trend-spotting and by the entertainment industry with lots of celebrities, famous bloggers and KOLs on the platform. With more than 462 million monthly active users on the platform, many international companies have registered for Weibo official accounts to promote their brands in China, such as L’OrealPro, Coca-Cola and The Australian Tourism Board. It is an effective marketing tool for businesses to deploy advertising strategies and boost their presence in the China market. 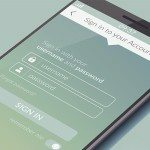 Users can open their own accounts and upload text or multimedia content (pictures, videos, gifs, etc.) which is shared with other users on the platform. Apart from standard posts, users can also hold live streaming sessions or upload “Weibo stories” (similar to Instagram stories). The story function allows users to upload a 15-second video/story that disappears after 24 hours. 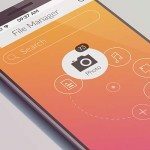 You’ll recognize these features from other popular social media platforms like Facebook, Instagram, Snapchat, etc. 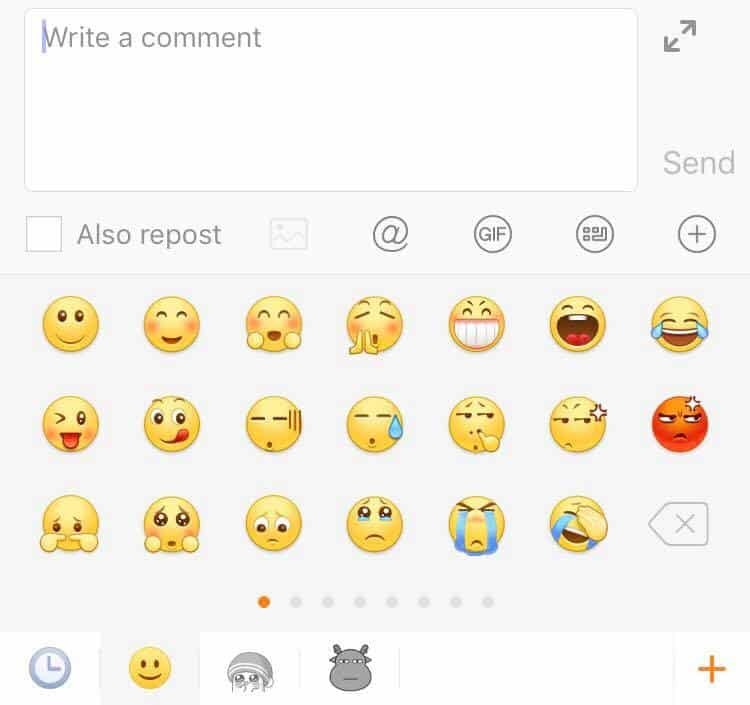 To foster communication between users, Weibo introduced functions such as: “Like”, “Comment”, “Repost”, “Share” and “Chat” (inbox). Users can also subscribe to particular accounts to keep track of their posts, or join chat groups with topics that they are interested in. Thanks to these versatile functions, Weibo has successfully built a thriving online community among its like-minded users. 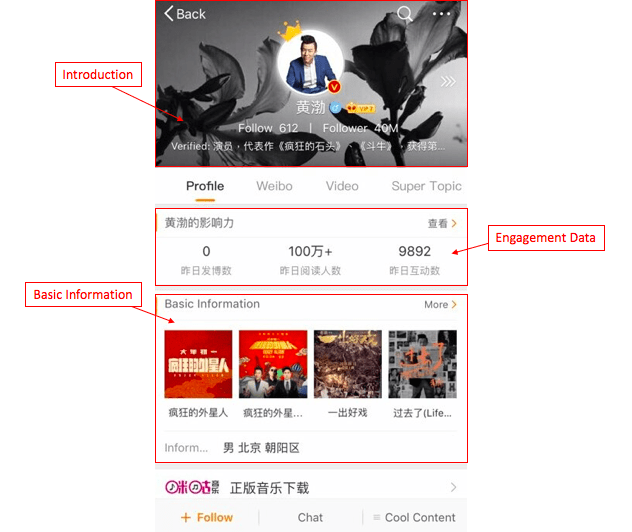 Below shows a typical Weibo account belongs to a famous Chinese Actor, Huang Bo (黃渤), which includes sections for “Profile”, “Weibo”, “Video” and “Super Topic” (users can add more sections such as Albums, Stories and Articles). In the “Profile” section, it displays basic information of the user such as Alias, Gender and Location. Users can also add featured photos, hobbies, hot topics and posts. As it is a verified public account, there is additional information such as the number of visitors and engagement data. For “Introduction”, it shows the user’s profile picture, name, followers data, bio etc., so that others can immediately recognize the account owner. Users can be verified according to their career, interest, content and business nature, which details would be explained here. 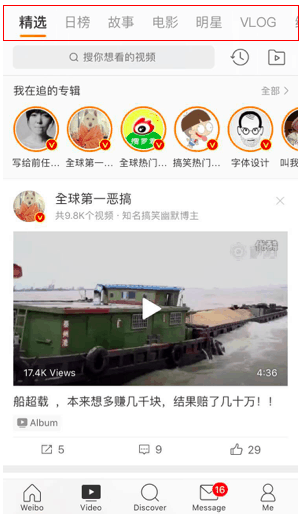 “Weibo” and “Video” show all posts and videos shared by the user. There is another feature called “Super Topic”, which is commonly used by celebrities as it gathers related posts shared by other users (mostly fans), similar to a hashtag. For example, as Huang Bo is an actor, the super topic under his name includes several discussions, pictures and videos related to him. 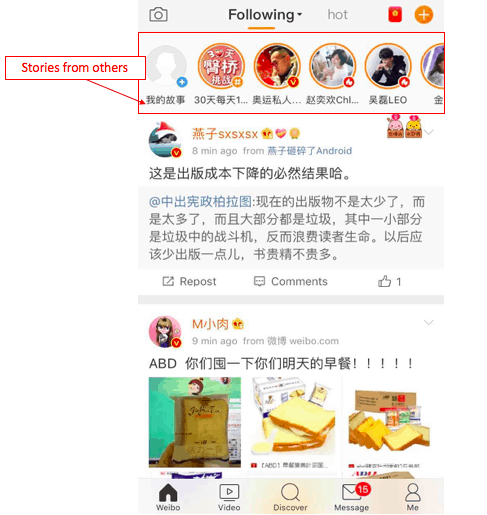 On the Weibo app homepage, we can see “Following”, which shows the latest/hottest posts and stories from accounts that you are following. 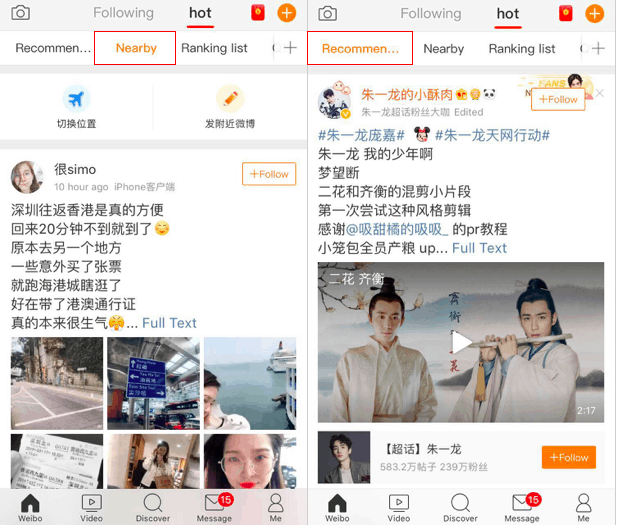 For “Hot”, Weibo uses a recommendation algorithm to create a customized page based on users’ browse and search history, other sorting algorithms such as “Nearby”, “Ranking List” and “Food” are also used to ensure the most interesting and up-to-date content for users. 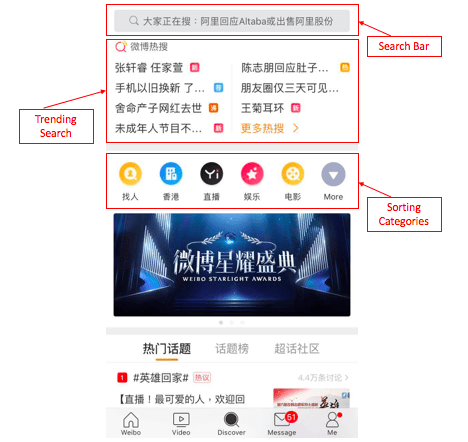 The “Discover” function acts as a comprehensive search engine within Weibo, it groups hot topics and sorts them into different categories, such as “Entertainment”, “News” and “Sports”. Users can simply insert random keywords and various related search results will be shown. 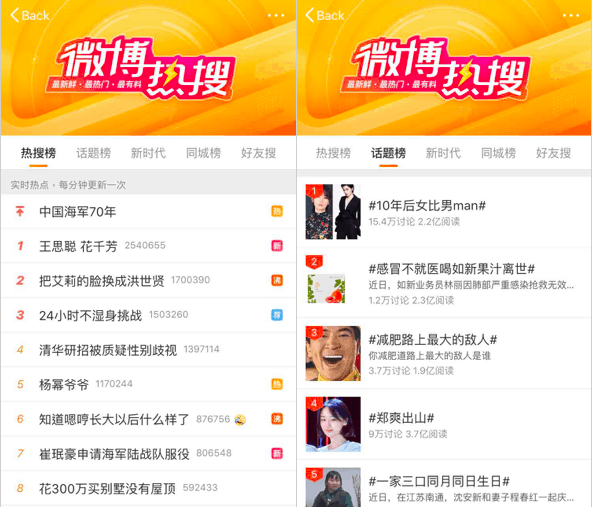 Weibo also generates a list of “Trending searches” and “Hot topics”, which showcases the top 50 trending topics that people are discussing, so that users can always get the most updated information easily. To make browsing more efficient and convenient, Weibo gathers all videos in a single page, “Video”. On the featured homepage, there are popular videos across the platform. Other sorting methods such as “movies”, “Celebrities” and “News” are also available for those who are interested in particular topics. 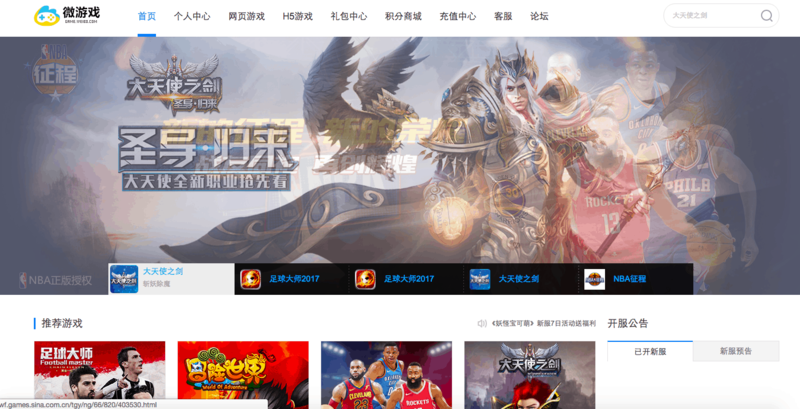 Different from more traditional social media platforms, Weibo took advantages of its positioning and user base and launched a game centre Game.Weibo.Com, which provides a variety of online games for users. On the platform, there are games with focuses ranging from the NBA to Pokemon, which has attracted huge groups of people to log in and stay on the platform for longer periods of time. Apart from features mentioned above, Weibo also provides a lot of extra functions such as Weibo Fit, which records sports and health data like walking distance and calories burnt. Another main function would be Weibo Wallet, which claims “paying online is just a tap away”. Through the wallet, users can make payments within Weibo for any product someone shares or links to within the app. People can pay loans, buy insurance, buy movie tickets or even see an online doctor through the app! All you need to do is link your credit card or Alipay account and you can get started! Being one of the largest information sharing platforms in China, Weibo not only attracts ordinary users, but also representatives from different sectors, such as celebrities, media, government authorities and corporations. 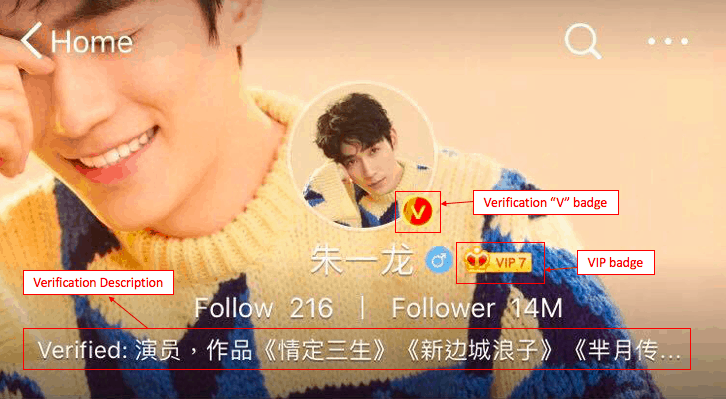 To distinguish different types of users and encourage active content sharing, Weibo introduces a rather complex user badge system, which includes user Level, verification and VIP membership. 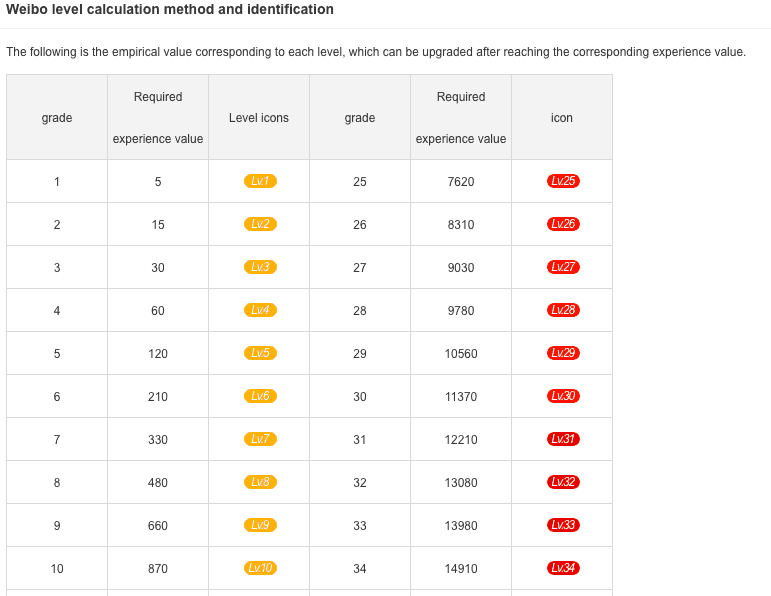 To encourage active usage and foster connections among users, Weibo helps users to calculate their “empirical value” to identify their “user level”. Users can earn extra “empirical value” by completing tasks set up by Weibo, such as writing a post, sharing others’ posts and subscribing to certain number of accounts. A specific user level badge would be shown on the profile introduction page. Given that there are a large number of celebrities, media workers, enterprises or even government authorities opening accounts on Sina Weibo. Weibo uses a verification policy to avoid impersonation and ensure authentic information sharing (similar to Twitter’s verified accounts). Celebrities’ account are be given an orange “V” badge, while organizations and companies’ accounts have a blue “V” badge. Aside from the “V” , a verification title will be shown on a users’ profile to describe the users’ identity. There are several types of verifications, such as individual verification (celebrity, politicians etc. ), organization verification (government departments, social media platforms and brands etc.) or any account that is of public interest. The real-name certification is useful to differentiate micro-influencers and authorities from ordinary users. So what’re the advantages of verification? 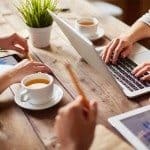 Getting your account verified helps you to build trust and reputation among your fans, especially when publishing brand-related content. Besides, Weibo provides many privileges for verified accounts, such as advanced page customization settings, access to the lucky draw management platform and additional services like mass messaging. According to the Weibo Data Center, the number of verified corporate accounts on Weibo has reached +1,500,000 in 2018, covering nearly every industry and including: e-commerce, food & beverage, tech, fashion, and so on. Learn how to open a verified account here. Weibo launched a paid VIP membership scheme in 2012, which allows users to “upgrade” their profile functionality. The VIP membership is split into 7 stages, from VIP 1 to VIP 7, members would need to gain “growth value” to “upgrade” their VIP status. With a regular monthly membership (¥10/month), you would get 10 growth value points a day. While Annual members (¥108/year) enjoy 15 growth value points/day. Each time you pay for a one-year membership, you get an extra 200 growth value points as a reward. The VIP membership is important as it is a proof of being something greater than your average Weibo user. It is noteworthy there would be a special “Crown” badge next to VIP members’ name. According to the 42nd China Statistical Report published by The China Internet Network Information Center (CNNIC), China’s Internet population has grew beyond 800 million in 2018, which makes up 57.7% of the entire Chinese population. Most interestingly, around 788 million are reported to be mobile Internet users, which indicates that mobile technology has become indispensable for people’s everyday life. Being one of the leading micro-blogging platforms in China, Weibo’s growth has closely followed the Internet trend. According to China Internet Watch, Weibo reached a total of 462 million monthly active users (MAUs) in Dec 2018, which covers more than 50% of the Internet population in China. Nearly all of them (93%) access the platform via mobile. According to the Weibo Data Centre, the platform has reached an impressive 10+ billion monthly Weibo post impressions, which proves that Weibo has a highly engaged user base. 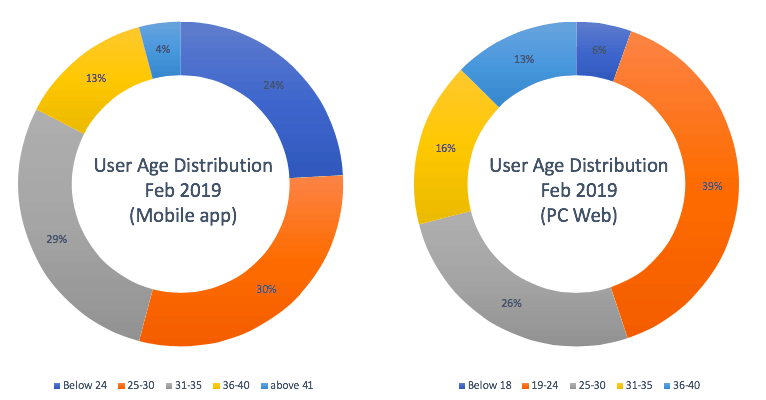 According to IResearch, Weibo has a significantly younger user demographic, for which more than 50% of them aged below 30 (for both mobile and PC users). Regarding performance highlights, Weibo’s net revenues totaled $1.72 billion, with 1.5 billion coming from marketing and advertising revenues. With such impressive usage and revenue data, we can see that Sina Weibo is definitely taking up a leading role in China’s social platforms. Being a popular micro-blogging platform, Weibo has always been compared with another of the world’s biggest social media platforms – Twitter. 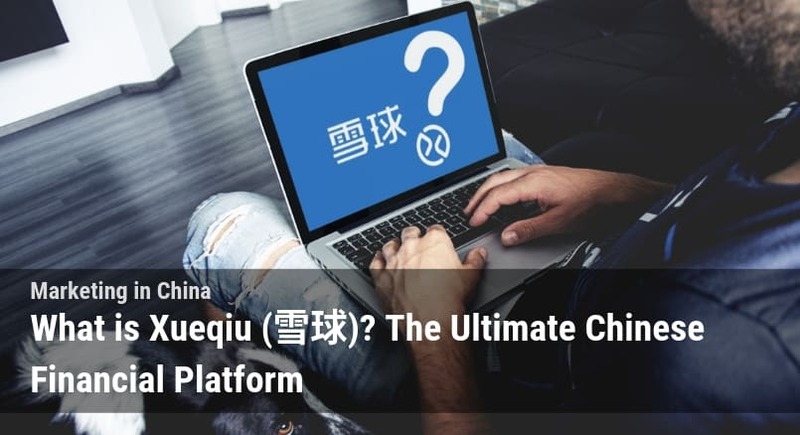 In fact, both of them are leaders when it comes to micro-blogging platforms of the world – with one being used in China and one for the rest of the world. They share similar features, such as allowing users to share content and follow others for their latest posts. Besides, both of them implement a verification policy to identify accounts of public interest. Yet, it is said that in recent years, Sina Weibo has evolved beyond “China’s Twitter”. It has transformed into something completely different from any predecessor by providing more versatile, customized functions, and has surpassed Twitter in terms of functions, interfaces and user base. As mentioned in previous session, Sina Weibo has reached a total of 462 million monthly active users (MAUs) as of Dec 2018, surpassing Twitter, which has reached 270 million monthly active users worldwide as of January 2019. Still, it is difficult to compare the two platforms directly as they focus on different target markets. For Twitter, which is blocked in China, despite the fact that it originated in the United States, around 80% of Twitter accounts are based outside the United States. The top three countries which Twitter is most popular in are Japan, the United Kingdom and Saudi Arabia, which shows the internationalization of Twitter. For Weibo, as most of the content is in Chinese, it is difficult for foreigners to use the platform, which means that it is only prevalent in Mainland China or with Chinese living abroad. Still, since the launch of Weibo Hong Kong and Weibo Taiwan, many people in Asia have also starts using Weibo. 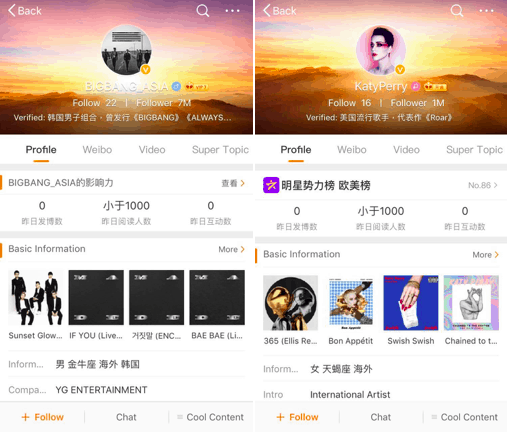 Some foreign celebrities such as BigBang (The Korea Boy Band) and Katy Perry (American Singer) has also created verified accounts on Weibo. Apart from the common features of a micro-blogging platform, Weibo has taken a step to further establish more sophisticated functions, which has transformed Weibo from a simple micro-blogging site to a comprehensive social media platform. For example, Weibo introduces “Weibo Fit”, which helps users monitor their exercise and health conditions. “Weibo Wallet” enables users to make payments directly through the app. 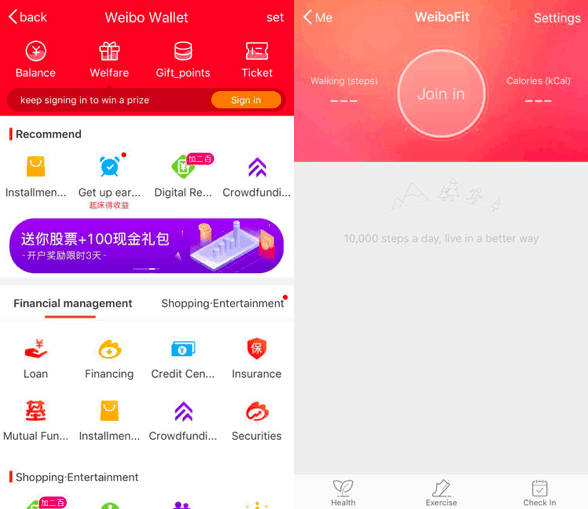 With the Weibo wallet they can purchase a range of products and services including: Financial Management, Shopping, Entertainment, Health Consultations, or even just donate to their favorite accounts on the platform! Besides, the Weibo Game Centre has attracted a lot of youngsters to the platform, in an attempt to stay relevant with newer generations. For marketers, Weibo has introduced promotional campaigns to provide flexibility for those who have a limited budget to advertise on the platform, such as the lucky draw and content creation activities. The process would be monitored by Weibo official, which ensure fairness throughout the activity. If a Twitter user visits Weibo for the first time, she/he may be dazed by the complicated interface of the platform. For example, on the “Following” page, users can further sort the posts by “Special Following” (people you are most interested in), “Celebrities”, or even “Colleagues”. If you choose the “Hot” homepage, you can customize the page using filters ranging from “Nearby” to “Funny”, and all the posts are refreshed every time the user reloads the page. Comparatively, Twitter’s homepage is rather simple, only showing users “Top Tweets” and “Latest Tweets”. Apart from the homepage, Weibo also introduced the “Video” page, which gathers all the videos posted on the platform. Users can again customize it by using filters like “Movies”, “VLOG” and “Variety Show”. 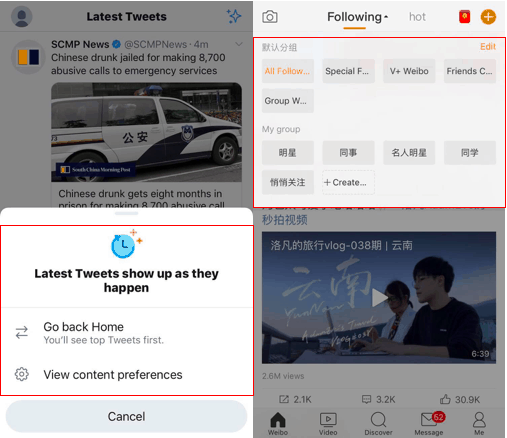 To conclude, Weibo provides more engaging interfaces and detailed filter options, which helps users to truly look for content that they would like to view. 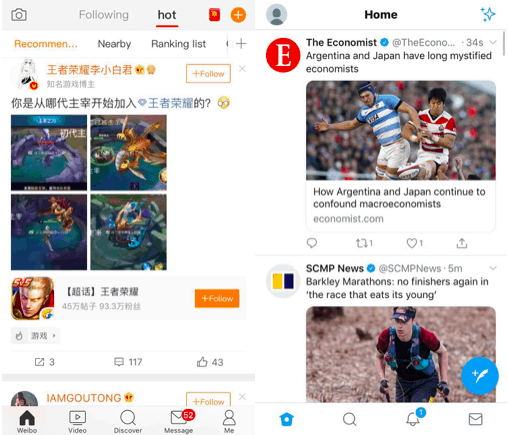 The overall interface style of Twitter is quite tidy and formal with a blue tone, while Weibo’s interfaces look more fun and entertaining with an orange tone. We can see that Twitter and Weibo do share a lot of similarities, but the two platforms have evolved differently in the past few years. In 2018, Weibo’s net revenue totaled $1.72 billion, while Twitter also ended the year with a net revenue of 909 million. It is expected that the two giant platforms will keep competing for the international market in the foreseeable future. 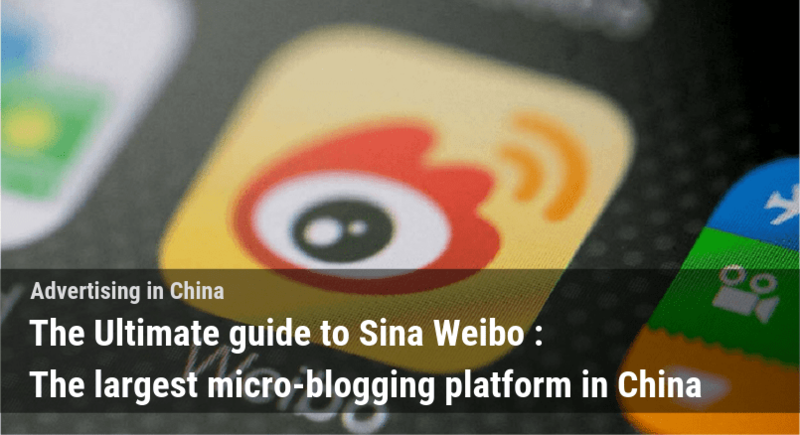 How to set up a Sina Weibo business account? 1. What’s the difference between a personal account and a corporate account? A corporate account is a verified official account for companies, government authorities and various organizations. Different from a personal account which represents an individual, a corporate account serves as a party of public interest. The corporate account provides more professional features compared to a personal account, which includes fans service, event centre, data centre and an ad centre. 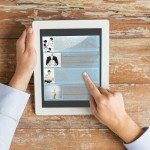 Businesses can enjoy benefits such as personalized page display, data analysis and social CRM tools. To open an official account, organizations must go through the verification process by providing official documents to Sina, Sina Weibo’s operating company, to prove the legality of your corporation. Once approved, you would be able to open a corporate account with an exclusive identifying blue “V” badge. While for a personal account, you can register an account simply by filling in your basic information here, the only requirements being your birthday and mobile phone number. 2. How powerful is a Weibo corporate account? Opening a corporate account is of paramount importance, as the verification badge serves as a source of credibility for your customers and the public. With the account, companies can improve brand recognition and loyalty by posting information about the latest product launches and launching promotional campaigns, and can improve customer service and engagement by interacting with fans. In 2015, Weibo expanded its e-commerce business by cooperating with mainstream e-commerce platforms such as TaoBao and Jumei, which let users open a “Weibo Window” to sell products. The “Weibo Window” has become a powerful tool to boost sales as users can buy products when visiting your profile/reading your product reviews. 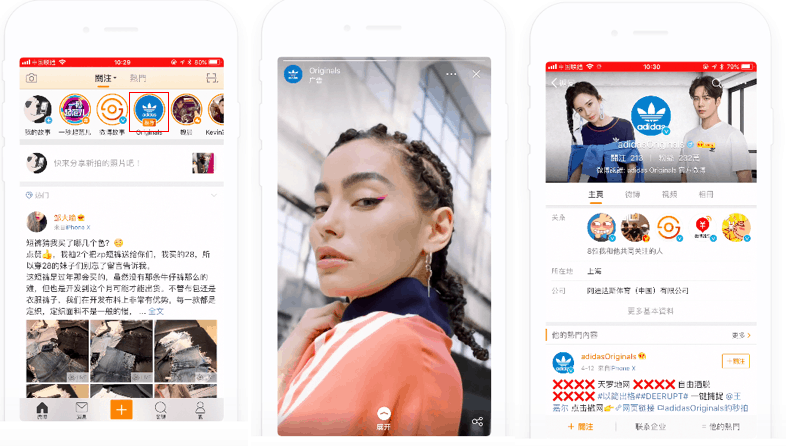 In 2017, Weibo took a further step by launching a “Content-driven marketing platform”, which connects businesses and influencers to fosters sales activities within the platform. According to Wang Gaofei, chief executive officer of Weibo, the businesses would increase content-driven e-commerce investment to enhance content capabilities and empower producers, we predict that content-driven marketing will be the main focus on Weibo. Sina Weibo has done a great job in combining social media and e-commerce, businesses can utilize this platform to improve their marketing efforts and boost sales with relative ease. To begin with, let’s learn how to set up a Weibo Corporate account with our step-by-step guide. Enter an email address/mobile number, password, nickname (brand/company/organization) and location here. Sign up through phone confirmation. Check your registered email and activate your Weibo account. Log in to your account on Weibo, which you should be directed to the Certification Home. Fill in company information for verification (you will get the blue “V” badge after completion). 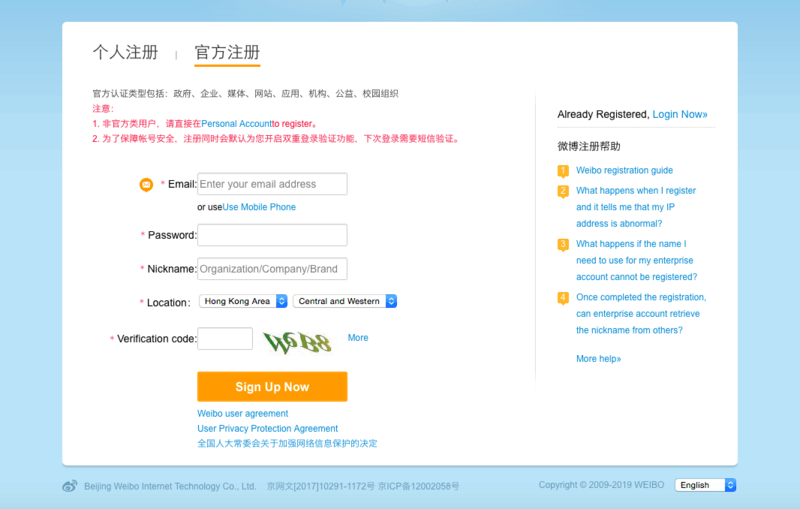 Verify your account like a local China company, which costs ¥300/year. 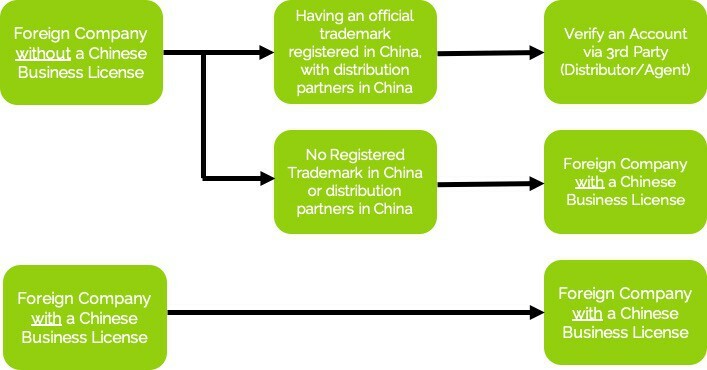 If you have your trademark registered in China, you may open a Weibo account through your official dealer/agent, which also costs ¥300/year. For companies who are completely new in China, you should register a new foreign business account. 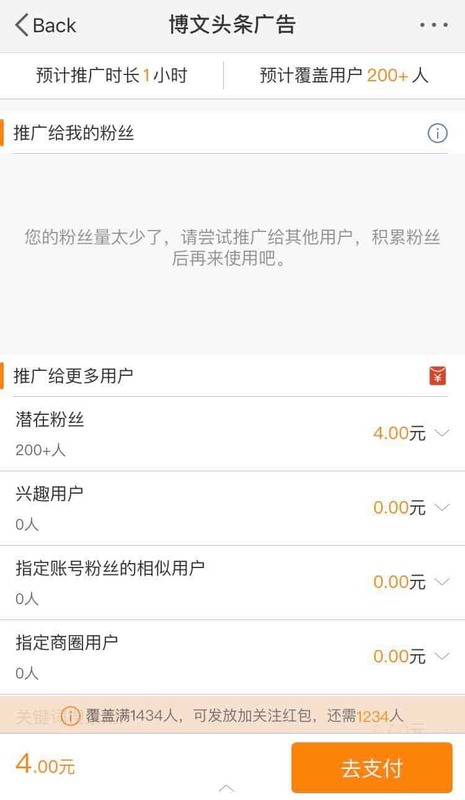 Weibo charges $1,000 USD dollars as one-time verification fee for enterprises, websites and educational institutions (fees for document verification, translation, and notarization). Verification for organizations such as government, media, application, public interest, and non-profit organization is currently free of charge. *Documents for overseas enterprise registration should be sent to [email protected]. 4. How to set up a Weibo Window (Weibo’s E-Commerce Platform)? For Weibo users, Weibo Window does not require further registration, which is very convenient and user-friendly. It allows everybody, including a general user, to sell products on the platform. Weibo has formed alliances with several e-commerce platforms (Taobao, VIP.com etc.) that allows to link their certificated online shops on the platform. The function is also used by many companies, which include L’Oreal and Swisse. Find “Fans Service” in the user’s Weibo personal centre. 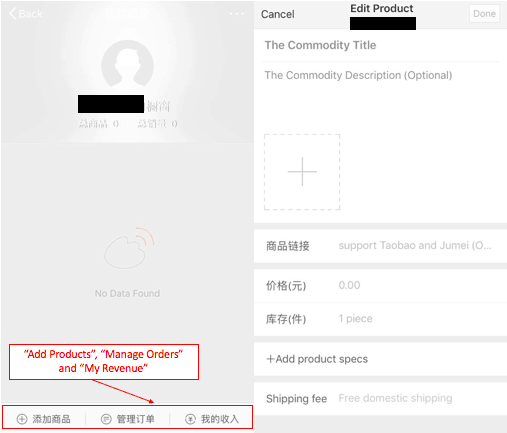 Manage your Weibo window with “Add products”, “Manage orders” and “My revenue” page. After orders are placed, sellers can access the “Manage orders” page to keep track of the order status. For the “My revenue” section, it allows sellers to check the total number of transactions and amount earned. Thanks to its open and public nature, Weibo provide precious opportunities for businesses who want to increase brand awareness and gain popularity in China. 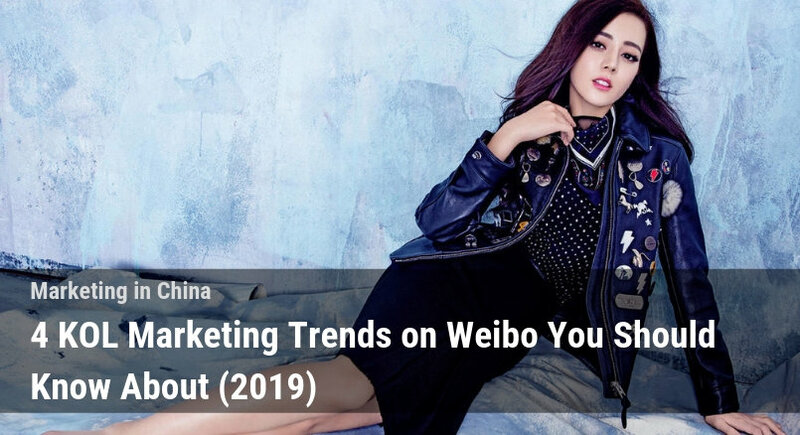 To help brands reach out to their targeted customers, Weibo provides several marketing packages which include things like display ads, Search Engine Promotion and influencer marketing. To kickstart your marketing journey, you should first register a corporate account/verify your official account. After registration and verification, you can customize your account homepage by uploading engaging banners, cover page and background pictures. Besides, you can also edit brand-related information to introduce your business to the public. 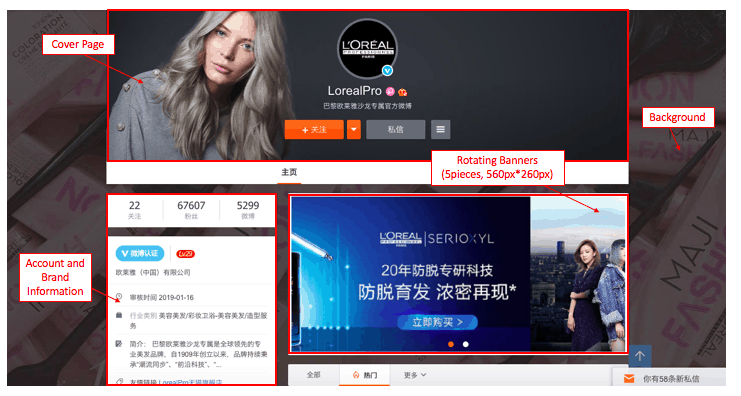 For example, L’OrealPro inserted a link to its Tmall store on the homepage, which directs its fans to shop for their products directly. After customizing your own account homepage, the next step would be creating engaging content to attract followers. Posts related to new product launches, advertising/promotional campaigns and festive greetings can be shared to foster interaction and update consumers constantly. To compose an engaging message, businesses can make use of the media-rich nature of Weibo to create multimedia content including things like videos, pictures, live streaming, and adding emojis in their posts. Besides, the “@tag” function enables users to tag relevant parties in the posts, while the “#hashtag” function leads users to a dedicated page that garners all posts with the same topic. To lead users to a specific website, you can also insert a link in the message. Hashtags just like on Twitter are very powerful for raising the public’s awareness towards different subjects. 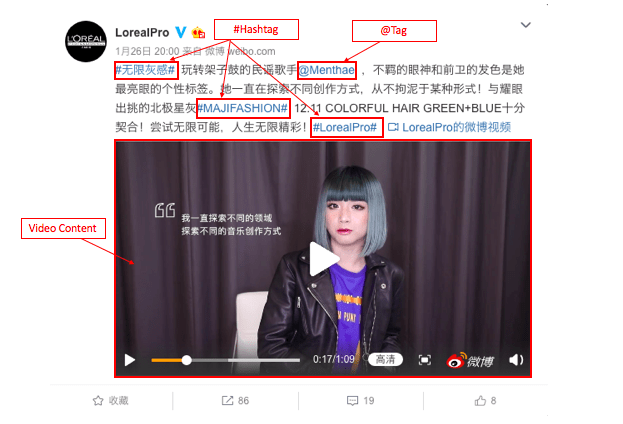 For example, LorealPro has tagged #MAJIFASHION# in the post, which is related to its newly promoted hair colour collection. When viewers click on the hashtag, they would be directed to a page that showcases all the related information, so that viewers can swiftly find and discuss the latest product launch. 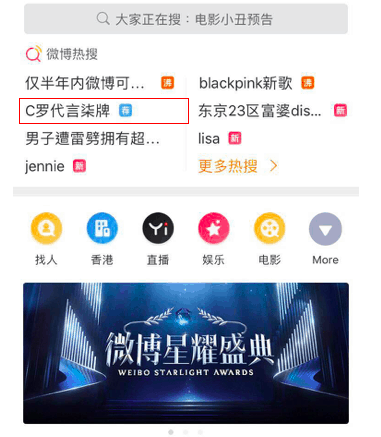 If the hashtag becomes popular on the platform, it can even be listed on the “Trending Search” or “Hot Topic” lists on Weibo search. Businesses can make use of special features on Weibo to implement online promotional campaigns. It is very cost-effective as the platform helps you to reach a large population across different regions in China with a smaller budget. Below we’ll introduce 3 types of promotional campaigns popular on the platform. Many brands make use of the “Repost” function of Weibo to launch promotional campaigns. It is popular as it enables participants to share the message within their social circle, thus spreading it around the online community very quickly. Lancôme launched a Repost Campaign in 2015, in which participants needed to repost a message about Lancôme’s newly launched eye products. The company would then choose 2000 participants to send out a 7-day trial of the new product. If participants post any content to join the discussion about #7-day eye miracle# and tag @Lancôme, they would have a chance to win a one-year supply of the brand’s best-selling serum. The activity attracted 13 thousand people from different regions in China (Beijing, Shanghai, Heilongjiang etc.) to share the post, and has successfully raised people’s awareness towards the new product. Content creation campaigns encourages users to contribute organic content related to the brand or product. Users can post content like pictures, videos or product reviews according to organizers’ instructions. The organizer would then picks winners and sends out awards based on the quality of content/ by random drawing. 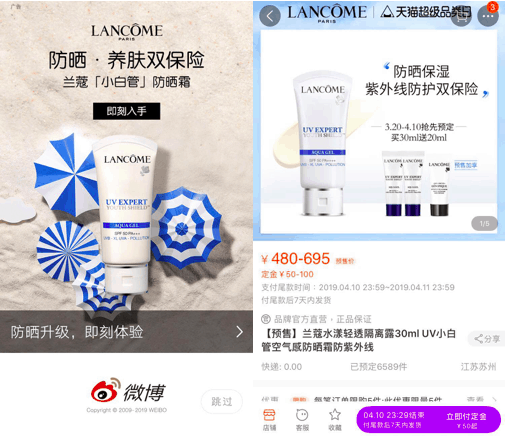 Lancôme made use of the function by asking Weibo users to share how they use Lancôme’s products for make-up or skincare with hashtag #Lancômers sharing Lancôme products# and tag @Lancôme. The company would then choose 10 winners and send them special prizes that cost ¥355 originally. The campaign achieved great success with 2433 people sharing their ideas on the platform. The Lucky Draw Campaign is held by the “Weibo Lucky Draw platform”, which is an official account handling all the lucky draw activities launched by users. For any individuals who would like to initiate a lucky draw campaign, they should inform the platform and share a post with activity guidelines (share, repost, follow etc. ), activity time, and prizes, then tag the “Weibo Lucky Draw platform” – @微博抽獎平台. The platform would help you to perform and monitor the process of drawing, which ensures fairness among all participants. In terms of campaign effectiveness, the biggest advantage is that the spread of information on the platform is very quick. The event message and information of the organizer can be spread and reach a lot of people across China rapidly, given that there are more than 462 million MAUs on Weibo. The Weibo campaign is very beneficial to brands or even individuals as the procedures of setting up online campaigns is very convenient. Weibo’s official accounts @Weibo official events and @Weibo Lucky Draw platform can deal with the whole process and answer any enquiries they the organizer has. However, as of 1/4/2019, the @Weibo official events have stopped functioning and users may need to wait for further announcements about Weibo lucky draw campaigns. Still, businesses can still make use of @Weibo Lucky Draw platform to launch lucky draw and repost campaigns. As mentioned above, Weibo Window enables users to link their e-commerce shops to their Weibo accounts. It can promote direct sales as users can browse all your product listings on a single page, or may purchase it right after reading product reviews on the platform. Grace Chow, a KOL in China who owns her own fashion brand has demonstrated how to make use of Weibo Window efficiently. She links her TaoBao shop to Weibo Window so that all products are properly listed on a single page. Interested buyers can simply click on the image and be directed to TaoBao.com for payment. Grace Chow further utilizes the micro-blogging nature of Weibo by uploading eye-catching pictures of her products to introduce the products to her audience. These usually focus on things like the quality of the materials, concepts for her designs, and dressing tips to build trust and differentiate her products. It helps to educate the audience and make them more familiar with the products, boosting sales effectively. To encourage interactions and raise brand awareness, she also launches give away activities frequently and select winners who have liked or reposted. 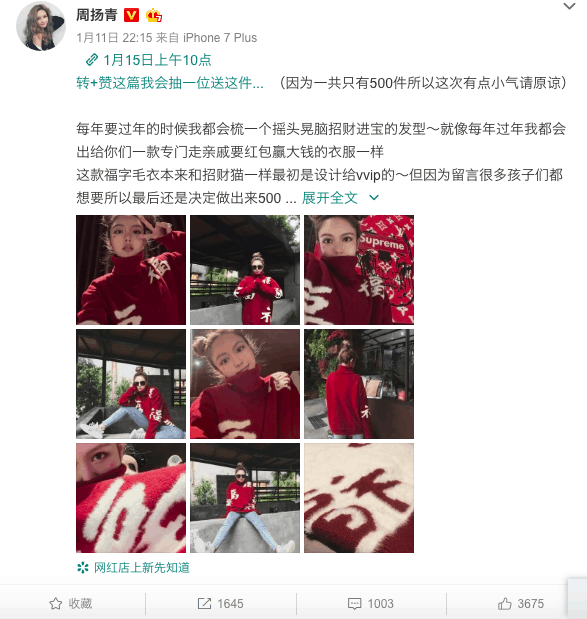 Her promotional posts receive more than 3,000 likes and 1500 reposts on a regular basis, which is a classic example of a combination of E-commerce (Weibo Window) and social media (Weibo micro-blogging). 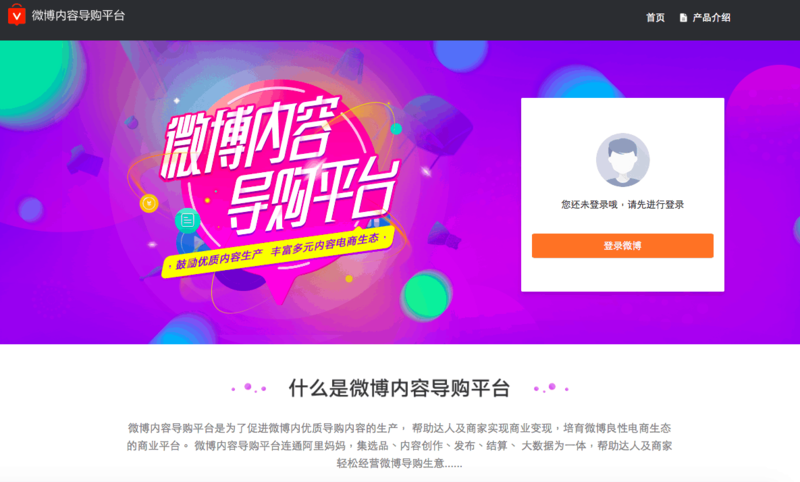 For those who are familiar with Taobao, they may have heard of the “TaoKe promotion” (淘客推廣) introduced by Alimama, which allows people to earn money by promoting TaoBao products within their social circle. 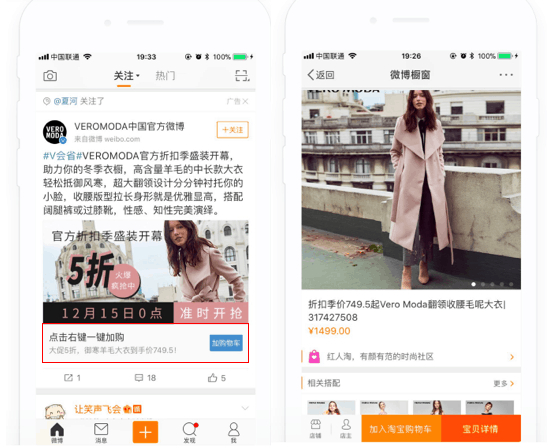 In late 2017, Weibo co-operated with Alimama and launched the “Weibo Content-driven marketing platform”. 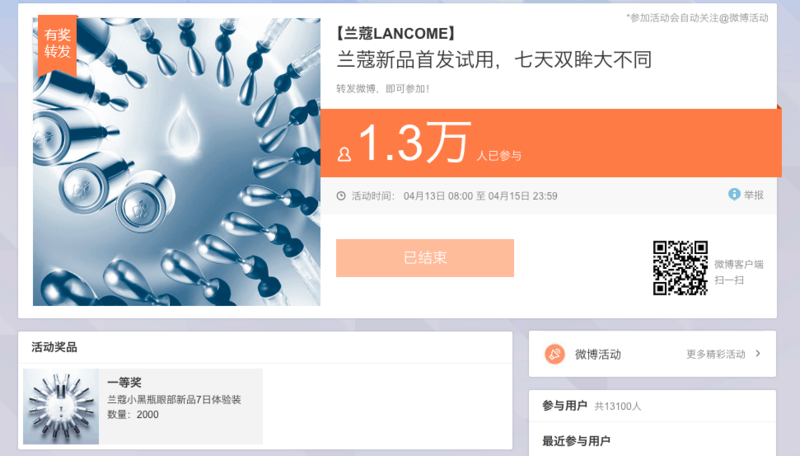 Similar to the “TaoKe promotion” initiatives, the platform connects shops registered on Alimama and users on Weibo who would like to earn extra income by writing promotional posts on Weibo. For Weibo users who have over 10 thousand followers and 100 thousand monthly page views, they can register on the platform and get automatically authorized if they pass the requirements. Weibo also welcomes registered advertising companies with minimum 3 accounts with over 100 thousand monthly page views. After registration, you can log into the system and choose what you would like to write about. Once a buyer purchases a product through your post and link, you can get commissions based on the commission rate. 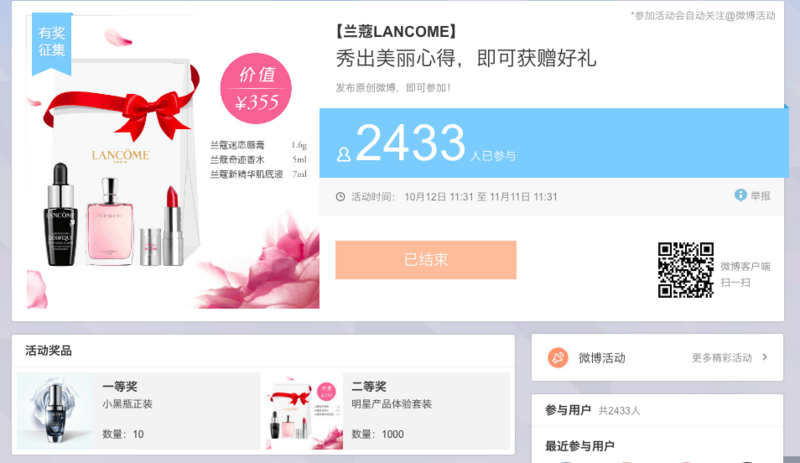 The platform provides precious opportunities for e-commerce stores who would like to raise sales and brand awareness through influencer marketing on Weibo. 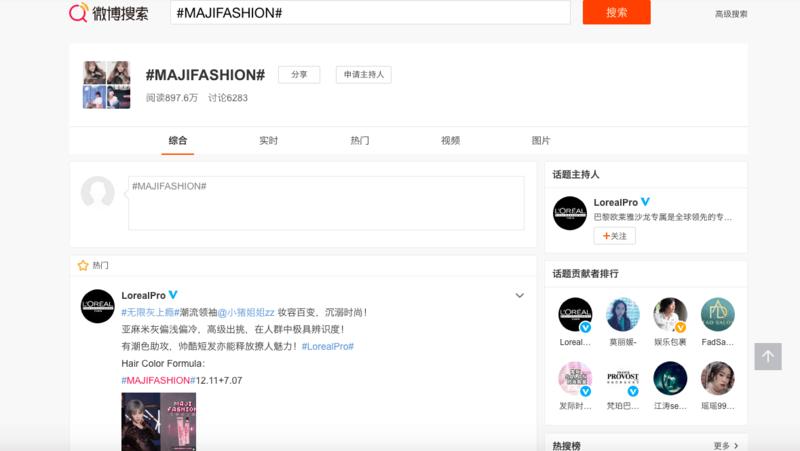 To enjoy the service, stores with Taobao/Tmall stores can register with Alimama, so that their products will appear in the platform’s database and be accessible by influencers. It is beneficial to sellers as no extra cost is incurred, they only need to pay commissions if the product is sold out. However, it can be difficult to get any attention on this platform if you’re brand new to the market and have little brand recognition or previous sales in China. Being a social media platform which earned 1.5 billion in marketing and advertising revenues last year, Weibo has done very well in providing marketing solutions for businesses on the platform. It has introduced several advertising packages which include display ads, search engine promotion, newsfeed ads, and video ads, which are popular among companies in different industries. Similar to many social media platforms, Weibo also features display advertisements, which include pop-up advertisements (support pictures, videos and gifs) upon opening the app, traditional banner ads, etc. Businesses can further add value to the advertisement by adding an “interactive function”, such as a “click here” button that direct users to a dedicated page (internal or external link). Display advertisements are very popular as most operate on a cost per click model, which results in only paying for performance. The upon app-open display ad is particularly useful for catching users’ attention as it pops up immediately upon opening the app. As mentioned before, Weibo has a “Discover” page that acts as a comprehensive search engine within the platform. It showcases hot topics around the community and sorts them into different categories. Users can perform advanced searches through keywords allowing them to browse related posts, accounts, and fan pages on the platform. Weibo has helped businesses to make use of the function by introducing “Search Bar Promotion”. Businesses can “buy” a search topic/keyword, after which their chosen post will be recommended as the top listed result in the search bar. Once the topic is searched, users would be directed to a designated page, which may be the brand account, fan page etc. Apart from “search bar promotion”, businesses can also consider buying search topics on the “Hot topic” and “Trending Search” lists. The topic that you purchase will be listed at the 3rd place on the list, with a “promotion” tag beside. This is incredibly powerful for fostering discussion or building buzz around a new topic or product. The search engine promotion is effective for boosting visibility and awareness. As the keyword can only be bought by one buyer within a specific period of time, it ensures the uniqueness of your promotional item. Different from display advertisements which mainly drives traffic to an external link (official website etc. ), the search engine promotion focuses on increasing the amount of attention and quantity of traffic to your Weibo account. Newsfeed advertisements are advertisements that are integrated within the explore page feed, businesses can customize the content of the promoted posts by adding text, pictures and videos around a specific topic. As the fastest growing ad format in China newsfeed ads tend to be pricier but also perform better than many other categories. Compared to display advertisements, newsfeed advertisements support multi-goals as marketers can insert specific “trigger buttons” to encourage users to take action, such as “Join now”, “Buy now” and “Download now”. For example, the fashion brand VeroModa launched a newsfeed advertisement to promote its winter sales. It inserted a “Buy now” button below the featured picture, which directs users to the Weibo Window and TaoBao shop once clicked. The action-oriented trigger buttons allow marketers to create campaigns around specific goals, such as inviting others to join an activity, buying certain goods and fostering app installations. It is effective in prompting immediate actions and lead generation. 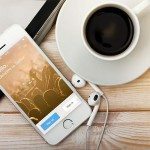 Following the trend of Instagram stories, Weibo also launched its “Weibo stories” in 2017, which allows users to post a 15-second short video or photo to share moments of their daily lives. 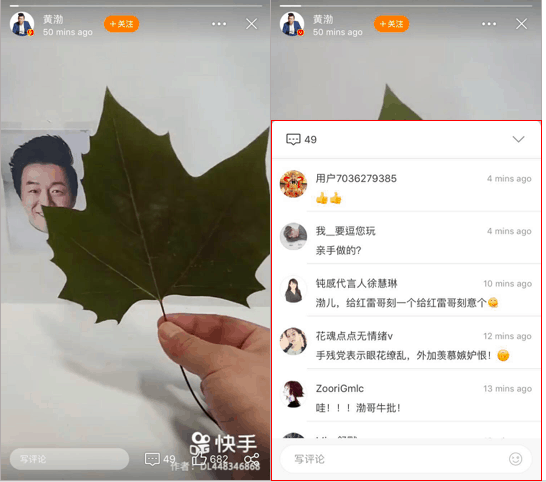 Unlike usual Weibo posts, users can make use of interesting stickers, text effects, filters, tags or even AR (using Apple’s ARkit) to compose an intriguing story. 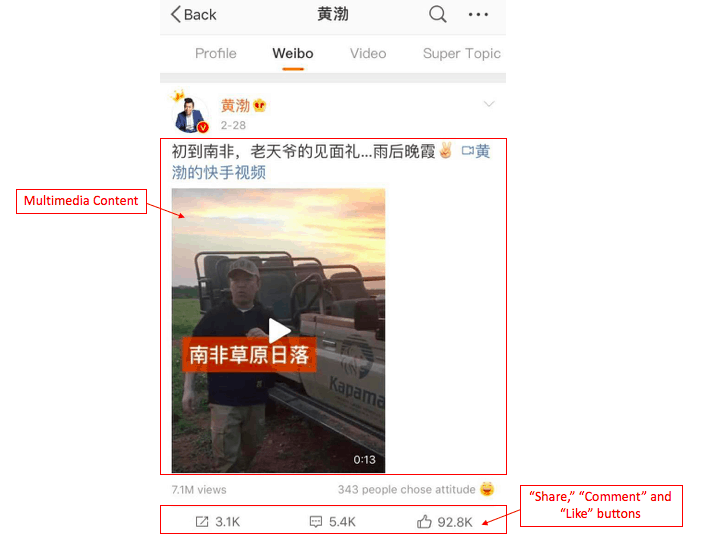 The Weibo story post disappears 24-hour in feeds, but users can also save it to their album after publishing. Different from Instagram stories, Weibo stories allows users to comment on stories publicly. This makes them slightly more interactive than the stories on Instagram. However, users can also disable the comment function. 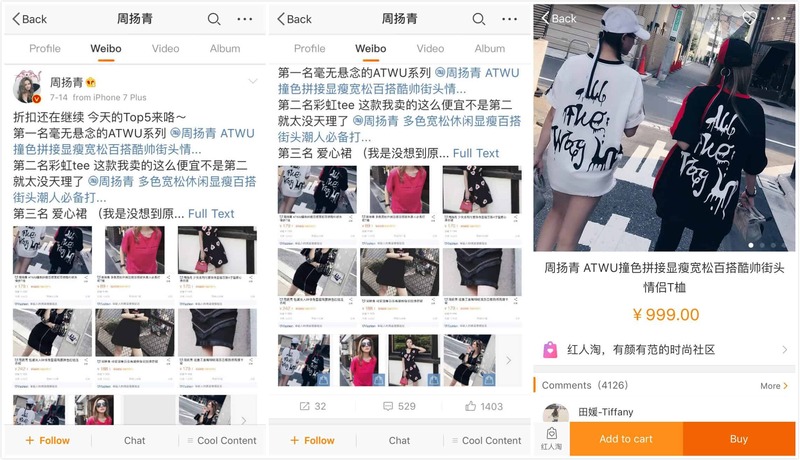 So how can marketers make use of the Weibo story function to advertise their products? 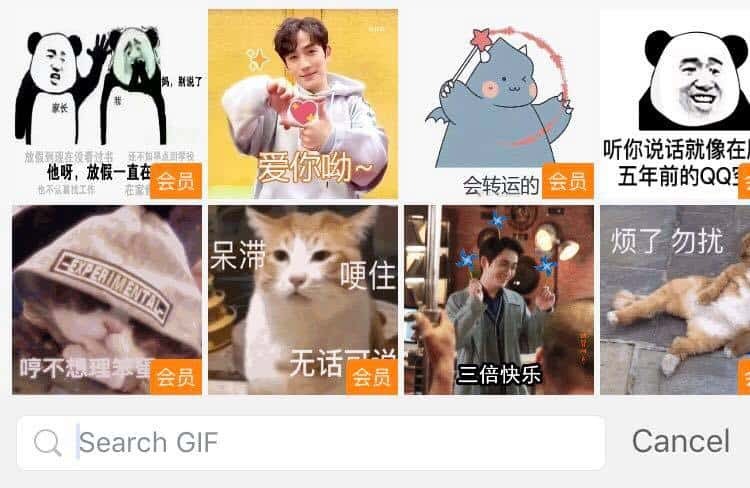 In fact, many KOLs and celebrities have been using Weibo story not only to share their daily lives, but to also recommend products/places to their followers. It is very effective as this kind of “advertisements” are considered less commercial and pushy, thus they can motivate viewers to try the advertised products in a soft way. 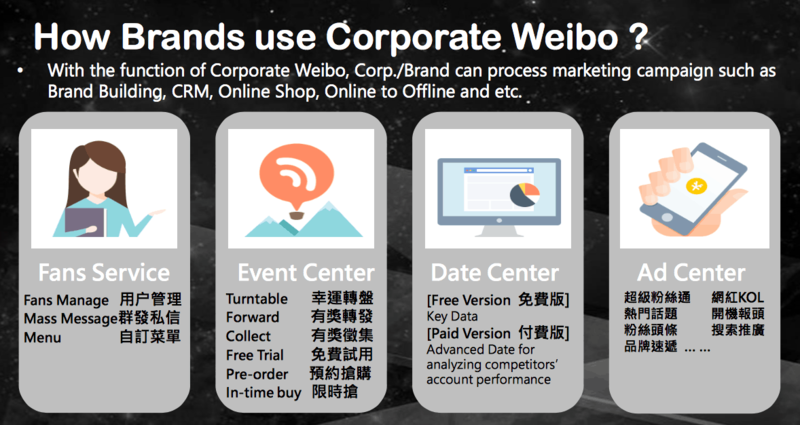 Weibo also launched marketing packages for businesses which would like to promote through Weibo stories. Businesses’ advertisements would be shown at the third place of the story list, with a tag “recommended”. Extra interactive functions such as “Unfold” can lead viewers to a specific page, such as your brand account. Apart from running a full-fledged marketing campaign, marketers can simply boost a specific post/advertisement to raise brand awareness and marketing performance by utilizing Weibo’s extra marketing functions. Super Fans Tunnel is an effective tool for businesses who would like to gain extra followers and reach new consumers. It functions by placing your Weibo post/account at the top of a targeted audiences’ news feeds like a “headline”. To maximize efficiency, you can specify the features of targeted viewers, such as age, regions, interests, life stages or even target those who have interacted with specific posts/topics. 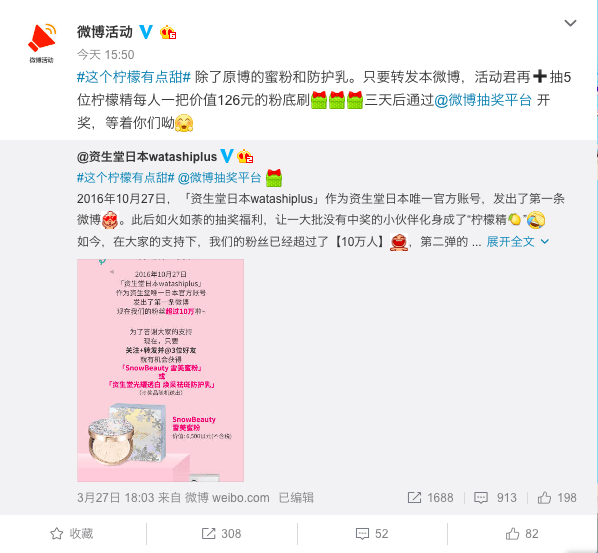 For example, if you are a cosmetics brand trying to boost a post featuring Lu Han, you may want to target females aged 18-30 (as Lu Han is popular among youngsters), and those who have followed cosmetics brands /KOLs’ accounts, or people who have interacted with Lu Han’s posts/topics previously, so as to ensure the effectiveness of the celebrity endorsement. Super Fans Tunnel is very popular among businesses as it helps you to reach a large group of Weibo users without being limited by your fan base. Besides, it is less costly and complicated compared to a full advertisement, which acts as an alternative for marketers who want to promote specific content. Super Fans Headline acts similarly to Super Fans Tunnel. However, the Super Fans Headline is more suitable for businesses who would like to seek more views and click-throughs within their existing fans base. The post or account boosted would appear at the top of the newsfeed of your followers, which is a strategy increase follower engagement. Still, for brands with a relatively small fan base, #Super Fans Tunnel may be more useful as it can help you to reach out to fans outside your following and increase your number of followers. It is noteworthy that to ensure users would not be bothered by repeating messages, the promoted posts would only appear as the headline once for each follower. To monitor marketing performance, businesses can access the data analytics tool in the Account Management Centre, which includes information such as the demographic details about your followers, performance data of each Weibo post and the number of page views on your account. There are some extra functions useful for marketing management, such as auto-replies private messages, mass-messaging and the Micro hotspot (which tells you the popularity of words on the platform). 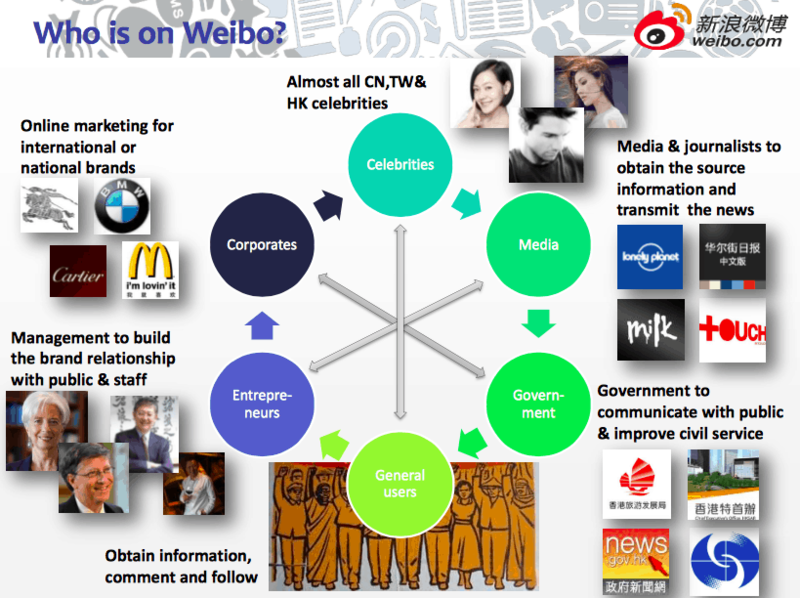 All in all, Weibo provides comprehensive marketing tools with different features for marketers to choose from. It is important for businesses to choose the right features to ensure to maximize cost-effectiveness. Weibo has provided an unprecedented way for people to publicly express themselves in real time, interact with others on a massive global platform and stay connected with the world. Apart from the local China market, Weibo has reached out to its neighboring countries by launching Weibo Hong Kong and Weibo Taiwan with traditional Chinese characters. To cater to the needs of foreign users, Weibo has developed an English edition for desktop and English apps for the iPhone and iPad. Although a full English, or other languages website interface has yet to be developed, we predict that Sina Weibo will begin moving towards internationalization, as competition in the domestic market continues to heat up. Hopefully this will provide more marketers with the opportunity to make use of this incredible platform. A girl from Hong Kong specializing in marketing and studying at HKUST. She loves yoga, drama and literature. Currently working with Dragon Social's content marketing team. Great article again, everything detailed is very informative advice, Thanks.